Omidyar Network leads investment in NYC-based software company to expand its reach and help communities address the social determinants of health. Unite Us, a leading care coordination platform that enables healthcare and social services to seamlessly work together to build healthier communities, announced a $4MM investment led by Omidyar Network, the impact investment firm established by eBay founder Pierre Omidyar. Unite Us has now raised a total of $10.3MM, with participation in this round from NY Ventures, Blossom Street Ventures, and Scout Ventures. The Company was founded in 2013 by Veterans and avid supporters who saw the need to coordinate care for Veterans and Military families. Today, their interoperable technology supports thousands of providers who serve Veterans, Medicaid and Medicare beneficiaries, and justice-involved individuals, who can now deliver care in integrated and accountable networks of healthcare and social services. Unite Us now provides the software and technical infrastructure to support over 7 million individuals across 31 community networks within 16 states. With the investment, Unite Us will expand its national footprint to over 100 communities by the end of 2018 and implement predictive analytics and automated workflows to increase provider efficiency and communication. By widening its community care network, Unite Us will help more providers meet the diverse needs of their patients by coordinating services such as housing, benefits, food security, and employment, alongside traditional and behavioral healthcare services. This will enable a growing number of communities to better serve their populations, measure and improve health outcomes, reduce avoidable spending in areas such as emergency room visits, and effectively address the social determinants of health for every patient. With Unite Us, barriers to access are removed as individuals with co-occurring needs are now supported through patient-centered, community-wide networks. Providers can connect with each other in real time through electronic referrals and automated outcome tracking, ensuring no patient falls through the cracks. Regardless of geography, providers along the continuum of care can screen patients, match resources to their specific needs, and ensure that they receive the care they need. Unite Us, with their partners, will continue to use granular, patient-level data and analytics to improve provider efficiency and ensure their communities get healthier. 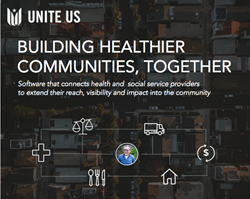 Unite Us is a Veteran-led technology company that builds accountable, coordinated care networks of health and human service providers addressing all social determinants of health. The Unite Us platform displaces legacy resource directories and single direction referrals by digitally inter-connecting health and community providers to efficiently address patients’ co-occurring needs. This transformative approach tracks every patient through their total health journey and reports tangible outcomes across the full range of services in a centralized, cohesive and collaborative ecosystem. Unite Us’ mission is to ensure that no need goes unserved and that every person is accountably connected to the right quality services.